We live in a time of change. The impacts of climate change are affecting populations around the world as well as here at home. Whereas in the past the somewhat singular focus of the environmental community has been on reducing greenhouse gas emissions and sustainability, the spotlight now is on adaption and resilience. Resilience has become a natural framework for emergency preparedness efforts and more recently for public health agencies. Now environmental and sustainability allies are joining forces in these other arenas to weave together a more comprehensive planning and readiness process. Reducing greenhouse gas emissions continues to be of critical importance as the entire world strives to meet the mandates of the Paris Accord, but creating robust and resilient communities has also taken on new meaning. Choices for Sustainable Living course is still accepting participants for next meeting: Getting Around Davis April 25th 7-9pm with speaker Jeff Flynn, the new general manager of Unitrans. Contact Lynne Nittler at lnittler@sbcglobal.net to sign up for the full remaining 7 weeks or to drop in to one of the other night’s topics: Watershed Stewardship, Resilient Eating, Energy and Microgrids, Consumption and Economy, Well-Being: Community Health and Personal Care, and Governance and Visions of Sustainability. Speakers include Lorenzo Kristoff, Kerry Daane Loux, Mark Van Horn, Anya McCann, and Leslie Crenna. The class will also be engaging in a series of weekly EcoChallenges through the Northwest Earth Institute. In general, resilience is the ability of any system to withstand a disturbance as well as its ability to reorganize following the disturbance, while keeping intact its same identity—its same functions, structures, and relationships. This second part of resilience is key: resilience is not just about being able to withstand a disturbance (such as a climate-related disaster) and returning to how things were before the disturbance; it’s also about the opportunities for reorganization and renewal of the system following the disturbance. The concept of resilience can apply to ecosystems: an ecosystem includes all of the living organisms in a given area, as well as the non-living things they depend on, and all of the interactions between these living and non-living parts. A resilient ecosystem can bounce back after a disturbance. As an example, consider a forest undergoing a bark beetle infestation. The bark beetles weaken individual trees, but if the forest is sufficiently resilient, it will be able to withstand the infestation and maintain more or less its same species composition. Resilience also applies to human communities. One example used in video-based materials created by the Post Carbon Institute in Santa Rosa titled Think Resilience asks viewers to imagine a storm hits a city and damages many of its buildings and other infrastructure. When the city rebuilds this infrastructure, what matters is not so much whether the structures are rebuilt in exactly the same way, but that the most important relationships remain intact. If the city is able to withstand the storm and retain its structure, systems and function, then it is resilient. The characteristics of a resilient system are laid in in seven topic areas by the non-profit organization 100Resilient Cities pioneered by the Rockefeller Foundation: reflective, resourceful, inclusive, integrated, robust, redundant, and flexible. Sustainability focuses on achieving the needs of the community today within carbon footprints that we can locally and globally afford, without sacrificing capacity for future generations to meet their needs. 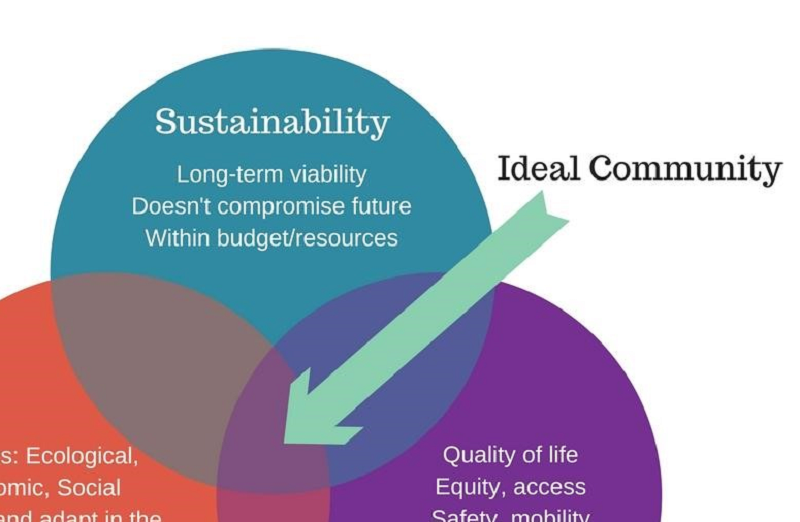 Sustainability also balances priorities across several areas, including the economy, environmental quality, energy, water and materials resources, transportation mobility needs and community equity, health and well-being. To that extent, in practice sustainability also incorporates elements of livability. Sustainability is thus more about the long-term viability of a community that controls resources for stable or maximum production. In contrast, resilience specifically refers to the capacity of a system to withstand change (such as a climate-related natural disaster) and to reorganize and bounce back following that change. 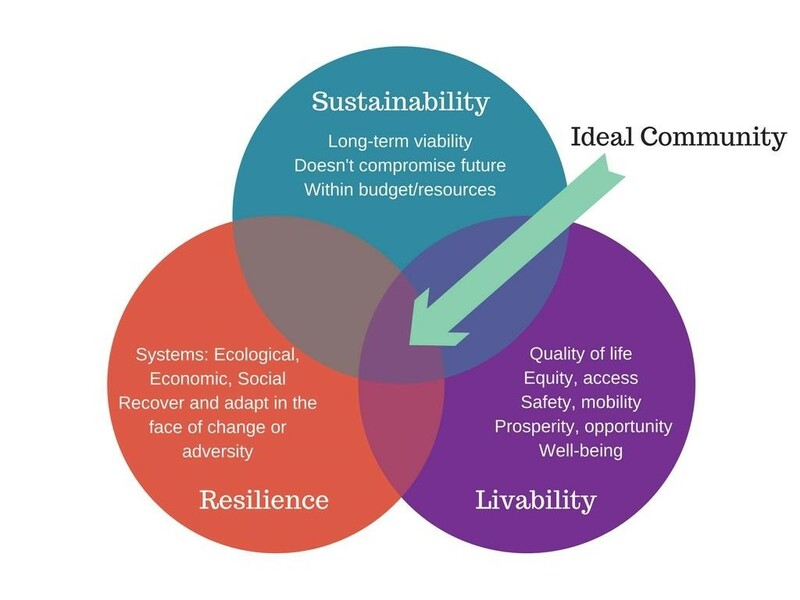 Additionally, a resilience approach assumes an uncertain and complex natural-resource context and aims to achieve sustainable long-term delivery of environmental benefits linked to human well-being. Sound sustainability planning and actions will have assessed risk and resilience. This winter a group of Davis community members got together and took part in a discussion series based on “Think Resilience” video and print materials created by Richard Heinberg of the Post Carbon Institute, one of the world’s foremost experts on the urgency and challenges of transitioning society away from fossil fuels. According to Heinberg, “we live in a time of tremendous political, environmental, and economic upheaval.” The time is ripe for change, starting at the community level. Group members learned why cities, neighborhoods, and individuals need their communities to be resilient to climate-related impacts like heat emergencies and housing stresses. They also explored what resilience means to individuals. One participant drafted a vision of a resilient Davis including neighborhood level gathering spaces that foster community, microgrids that equate to energy independence in the case of outages, and greywater and rainwater capture to reduce strain on ever scarcer water resources. As the group engaged with the “Think Resilience” course material, adopting a resilience lens, one of the big issues that emerged was the recognition that the assumption of ongoing, never-ending growth may itself need to be challenged. Several students participated in the first course, and the second course is also open to young and old. McKenna Maxwell, a fourth-year undergraduate studying Environmental Science and Management at UC Davis, found the first course useful. “It starts discussions which communities haven’t really had before, which was the purpose of the course,” says Maxwell. Jim Cramer, retired UC Davis Professor and a facilitator of the Davis “Think Resilience” group, was a member of the 2010 community Davis Climate Action Team that generated community ideas for the ultimate D-CAAP. “It was a good process at the time but it needs revision now,” says Cramer. 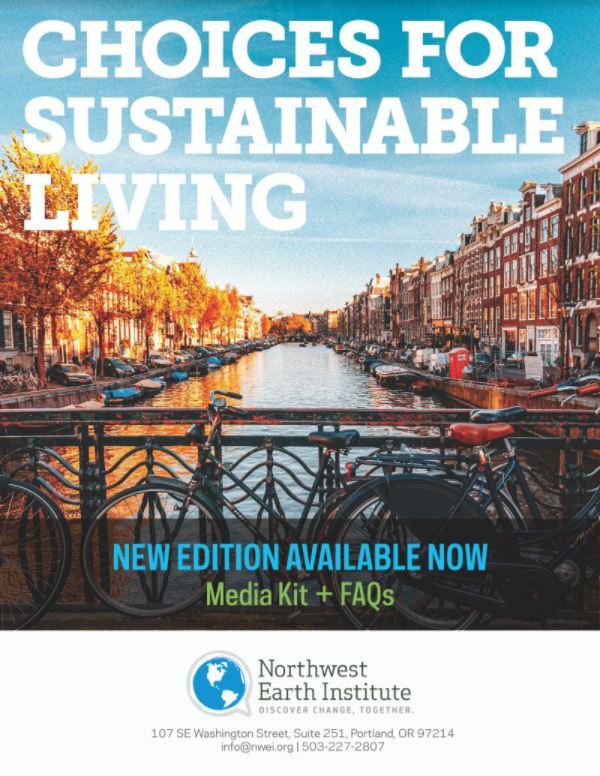 The discussions have sparked a second round of community engagement based on the Northwest Earth Institute’s “Choices for Sustainable Living” publication. 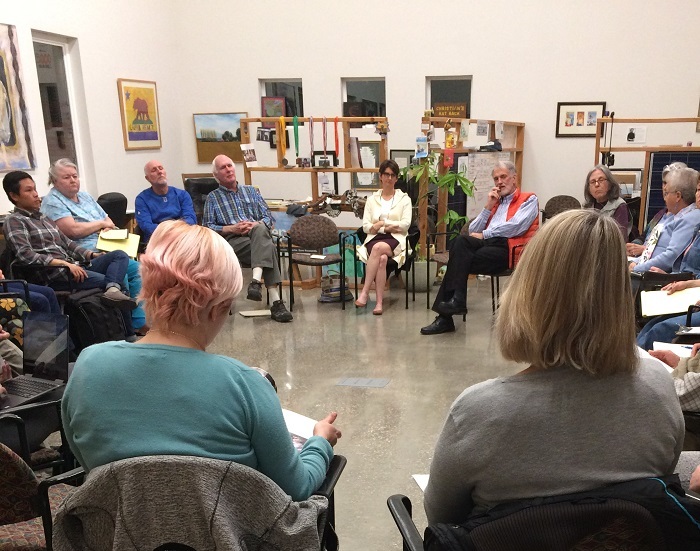 This second discussion course got underway April 18th and will further explore sustainability and resilience, with a specific focus on Davis. The course planning team is still accepting participants starting at its next meeting time, Wednesday April 25th from 7-9pm. The topic will be Getting Around Davis with speaker Jeff Flynn, the new general manager of Unitrans. Contact Lynne Nittler at lnittler@sbcglobal.net to sign up for the full remaining 7 weeks or to drop in to one of the other night’s topics: Watershed Stewardship, Resilient Eating, Energy and Microgrids, Consumption and Economy, Well-Being: Community Health and Personal Care, and Governance and Visions of Sustainability. Speakers include Lorenzo Kristoff, Kerry Daane Loux, Anya McCann, and Leslie Crenna. The class will also be engaging in a series of weekly EcoChallenges through the Northwest Earth Institute. The Local Government Commission is conducting a Call for Tour Proposals for the upcoming California Adaptation Forum, which is taking place August 27-29, 2018 in Sacramento. If you have any ideas for engaging tours that highlight on-the-ground adaptation initiatives or climate-smart projects, we encourage you to submit a tour proposal! Tour sites can include ZNE buildings, active transportation corridors, community revitalization projects, cooling centers, restoration projects, and more. If you have any questions, please contact Khrystyna Platte at kplatte@lgc.org. Annie Merritt is a Cool Davis environmental outreach intern working towards her Minor in Writing with the UC Davis University Writing Program and majoring in Environmental Science and Management with a focus on Natural Resource Management. Jan Beange is a Davis resident. She and her husband recently moved from San Francisco and Jan originally hails from New Zealand. Jan is a consultant and former lawyer. She has worked in the electricity industry, public policy, community outreach, and social justice. Jan has also been a city mayor. She is a yoga teacher who loves to stand on her head daily.